Unless one comes down with an illness or an infection that results in swelling of the lymph nodes, one is unlikely to be aware of the importance of the daily functions of the lymphatic system. Would it surprise you to know that the lymphatic system provides support for the immune, digestive, detoxification and nervous systems, and plays a major role in illness prevention and injury recovery? Similar to the way our circulatory system moves oxygen and nutrient rich blood throughout the body, the lymphatic system’s extensive network of vessels carries lymph fluid, largely composed of mineral-rich water, proteins and infection-fighting specialized white blood cells, to our cells, tissues and organs and carries away toxins, dead cells and waste materials. The heart, as part of the circulatory system, pumps blood throughout the body and returns it to the lungs, where blood is re-oxygenated and carbon dioxide is expelled. Dissimilar to the circulatory systems, lymphatic vessels carry fluid in one direction only, away from the tissues and towards the heart. Amazingly, the lymphatic system moves fluid throughout the body without active pumping, relying on the movement of our muscles and the action of lymph vessel walls and valves to control the movement of the lymph fluid. Vessels connect the lymphatic system, which consists of hundreds of lymph nodes, the bone marrow and the lymphatic organs–the tonsils, thymus and spleen. The lymph nodes generate and store white blood cells and function as filters, cleansing the fluid of debris. The tonsils play a defensive role against bacteria and pathogens entering the body through the nose and mouth. The thymus stores immature lymphocytes until needed and then activates specialized white blood cells, known as T cells, to fight infected or cancerous cells. When the spleen detects bacteria or viruses, it creates lymphocytes, white blood cells that produce antibodies to fight foreign invaders or prevent infections from spreading. Although bone marrow is not considered lymphatic tissue, it is a part of the lymphatic system, as it holds the responsibility for maturation of antibody-producing B cell lymphocytes. With all this going on, what could possibly go wrong? 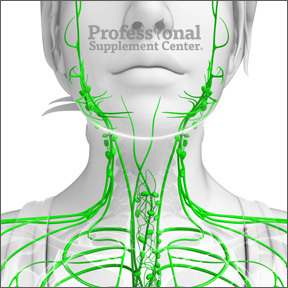 When the lymphatic system is functioning optimally, we stay healthy. When we are ill, it helps us regain our health. If the lymphatic system is overburdened or sluggish, it can lead to impaired immunity and result in fluid retention, chronic infections and inflammatory conditions. If it becomes dysfunctional, such as with a blockage, inflammation or an infection in the nodes, ducts, vessels or lymph tissues, it can lead to disorders. Lymphedema – This occurs when there is an obstruction that results in fluid buildup in the tissues. Elevation, compression and physical therapy are common treatments for lymphedema. Lymphadenopathy – This can lead to enlargement of the lymph nodes, such as when we are diagnosed with swollen glands resulting from a throat infection. Swollen glands that last more than a week or two require a medical diagnosis, as swelling can be symptomatic of other conditions, such as infectious mononucleosis or tonsillitis. Infections are largely treated with antibiotics or antivirals. In addition to its immune functions, the lymphatic system maintains fluid homeostasis and facilitates the absorption of fats and fat soluble nutrients in the digestive system. You can help to keep your lymphatic system functioning optimally by choosing nutritious foods over convenience, drinking adequate amounts of water and participating in regular physical activity. Eat a clean diet, not only for overall health, but to reduce the body’s toxic load. Avoid sugar laden, ultra-processed foods to ease the burden on the lymphatic system, the liver and the kidneys. Eat lots of enzyme-filled raw fruits and vegetables for their lymph cleansing benefits and to support proper digestion and elimination. Drink sufficient water daily, as proper hydration is critical to keep lymph fluid moving. Dehydration is a common cause of lymph congestion. Supplementation with proteolytic enzymes can support the normal metabolic functions of bodily enzymes and assist lymphatic flow, helping to clear toxic waste and debris in the circulatory and lymphatic systems. Exercise, such as brisk walking, stimulates lymph flow, aiding the muscles in moving fluid against gravity. Additionally, lying on your back with your legs up against the wall will reverse the flow of gravity to maximize lymphatic circulation in the lower body. Gentle massage helps to stimulate and move stagnant lymph. Lymphatic massage specifically targets and stimulates the movement of lymph fluid and helps to lessen the toxic burden on the lymphatic system. Dry brushing your skin is a common technique used in Ayurvedic medicine to boost circulation and assist lymphatic flow. Lightly brush the skin in the direction of your heart to encourage movement of lymph, facilitate blood flow and help clear out toxins. Protrypsin™ by Metagenics – This premium proteolytic enzyme formula is designed to support tissue health. Tablets are enteric coated for maximum effectiveness. Gluten free, Non-GMO formulation. Best Proteolytic Enzymes by Doctor’s Best – This exceptionally potent, high quality formula provides a broad spectrum of vegetarian proteolytic enzymes to support the body’s enzymatic metabolic functions. Gluten free formulation. Intenzyme Forte (Proteolytic Enzymes) by Biotics Research – This broad spectrum proteolytic enzyme formula supports numerous metabolic, physiologic and biochemical processes including healthy digestive, immune and circulatory function. Gluten free formulation. This entry was posted in Home and tagged Best Proteolytic Enzymes by Doctor’s Best, Intenzyme Forte (Proteolytic Enzymes) by Biotics Research, lymph nodes, Lymphadenopathy, Lymphedema, Our Life Sustaining Lymphatic System, Professional Supplement Center, Protrypsin™ by Metagenics, Serralase™ by ProThera, Vitamins and supplements, www.professionalsupplementcenter.com. Bookmark the permalink.